Taw: What about this one? 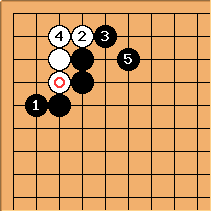 Normal joseki doesn't seem to work, but is there some other way to make life ? Charles Here the invasion should die: but there are some complexities. This suggested choice of could cause a major loss in some cases. But not with this choice of . Now at a expects to live somehow. zinger: the position after can also be reached by an invasion of a keima shimari, i.e. at , , . This may be more common. After here White has a dead shape in the corner. Therefore is wrong. Moving to the 2-2 point, as here, is an attempt to make ko after , . But Black gets round this with the placement at . 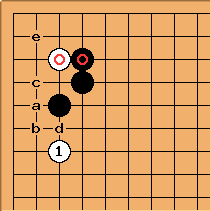 White is dead after , but has some aji at a or b. White can simply play and here, to which is the natural answer to try for an outright kill. 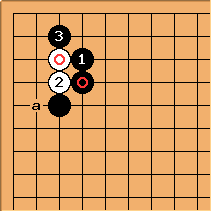 Then White has some good aji at a. 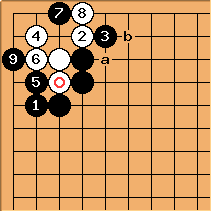 This is better than the previous variations that have a white stone at b - would White play there now? 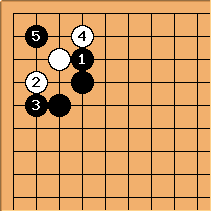 The most usual reason for White to play out the exchange / here, which is seen in high-level games, is to make a better play. Now White has the endgame move at a, which Black can't resist because after Black b, White c, Black d, White e, White is alive in the corner. 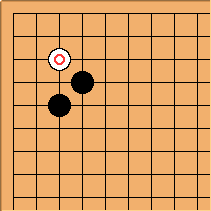 Calvin: Another idea which is common in pro play is for white to attach at directly, even if there is no helping stone near c. makes miai of a and b. If black plays a, white can make a position on the left side. 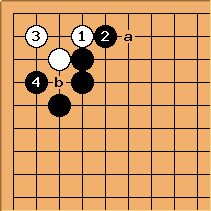 If black plays b, attempting to seal white in, it is not clear white can live but the aji will be bad. Timm(5k): How to answer this ? I'm also interested in the answer if there is a Black stone at (if that makes a big difference). p.s. Oh, I think I've found my answer. Is this way to play correct ?